By Patience Hodgson. 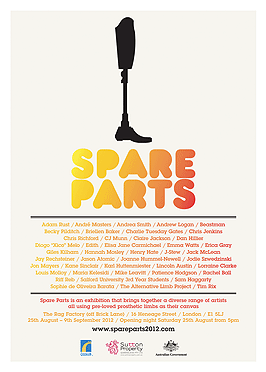 A Venutian Leg Up was in Spare Parts 2010 in Brisbane, and features in Spare Parts 2012.. Anybody watching the Paralympics can't fail to be amazed and inspired by the valiant efforts of so many Sportspeople who have lost limbs. But times are changing as seen by the use of the uncompromising Public Enemy track, featured in the TV trailers...There is a unique exhibition, curated by Priscilla Sutton, that looks through Artistic eyes....and reflects that change..
A remarkable exhibition of prosthetic limbs, which have been transformed into unique pieces of art is to be staged in London next month coinciding with the Paralympic Games in which many athletes with prosthetics will be competing. Exhibition currently on at The Rag Factory off Brick Lane. Her initial creative idea was to invite her creative friends to turn the limbs into artworks to have on her walls at home, but the idea grew and she mounted her first exhibition at the Brisbane Powerhouse two years ago. “I was amazed at its success,” said Priscilla. 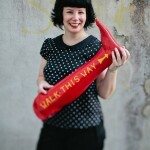 “Thousands of people visited the exhibition from art lovers, to amputees, and the general community alike. School groups came for tours and it was a huge hit with kids of all ages. 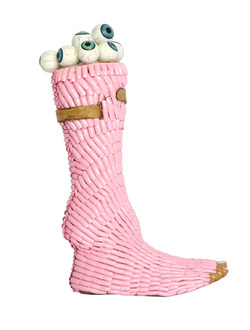 “We want to turn prosthetics into a positive conversation and try to take the taboo out of the subject. High-profile people like the athlete Oscar Pistorius and the many servicemen and women who have lost limbs and are enjoying a fulfilling normal and active life are also sending out very strong positive messages. Artfully Yours; 'I have seen the exhibition, I was kindly invited to the Private View by the Curator herself, and it is a really inspiring, humbling and visually striking exhibition...Go see!"